Many traders not unlike myself often find ourselves picking up trades which are against the trend. While often these can be phenomenal trades as the markets are not always trending, the inevitable “waterfall” scenario will eventually occur. The “waterfall” scenario is one in which a streak of green or red candles happen all in a row and the trader keeps following it for reversal trades. My experience with these suggests that these candles can range anywhere from 5 to over 20+ candles in length before turning around. Here are two example screenshots from my charts on EUR/GBP and AUD/JPY so that you can familiarize yourself more with what a “waterfall” scenario looks like. As you can see in the EUR/GBP chart that we have 8 green candles in a row, followed by a single red and then continuing another 4 green. 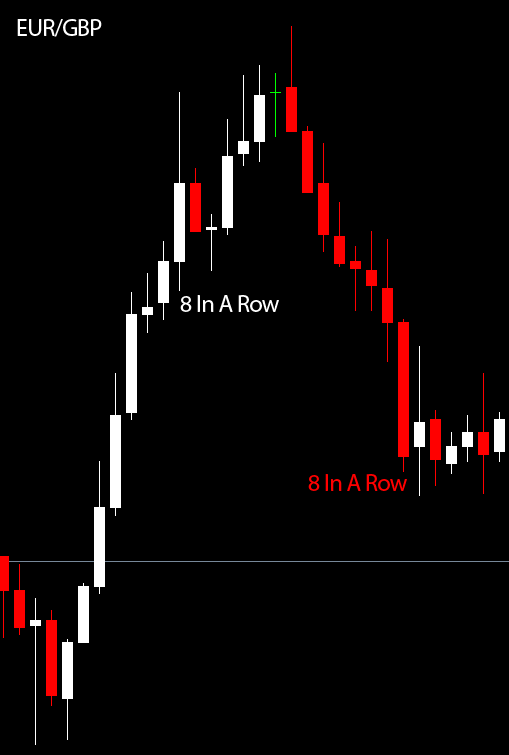 Similarly in the AUD/JPY we have 7 red candles in a row, followed by a small nearly doji green candle and then 5 more red candles in a row. Is it possible to predict when these are going to happen? The honest answer is that we as traders cannot always predict when this scenario is going to happen. The market can easily start trending hard during news announcements, however they can also happen at random times during the day without any news. We simply need to be ready to STOP, and sit on our hands, and wait until the market resumes prime reversal trading opportunities. If we cannot predict these, how can one help ensure that they do not get stuck in any of these types of trades if they are a reversal trader? Over the past few years I’ve found myself constantly on the lookout for 5 or more candles in a row and immediately stopping any further reversal trades. It’s certainly hard when you see 7 candles in a row and you believe that the probability that the market will turn around is so much greater, however it’s still not very safe. We still at this point will have no idea where it is likely to end and turn around, it could easily go another 10 bars in a row. So, until we find that the trend has likely stopped as you will see below, we need to sit out and be patient. There is no point in executing further reversal trades against a heavy trend with the likely hood of further losses being so great. How do we know when the “waterfall” has likely ended? 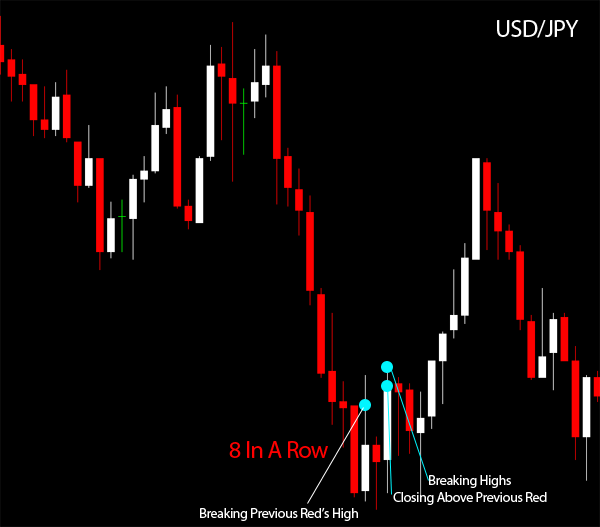 What I look for after a waterfall trade setup with 5+ bars in a row is the breaking of previous red bars and closing above previous red bars. Once I see this begin to unfold, I am often ready to get back in the markets. However if I do not see this type of setup helping to confirm the possible end of the trend, the likelihood of it continuing is far too great for me and any further reversal trades would likely lose. Here is an example below of what I consider to be a perfect end of a waterfall.